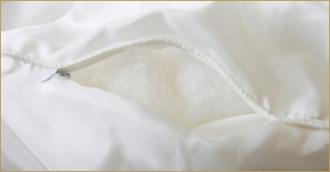 Silk Bedding Direct is a producer and provider of high end luxury mulberry silk-filled duvets, from cot bed size to super king size. 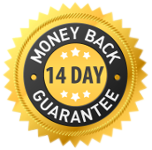 What you receive is a fabulously comfortable Luxury Range cot bed size top grade long-strand mulberry silk duvet that is 100% natural and hypoallergenic. 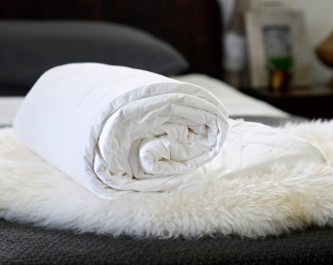 The duvet will wick away moisture should you become too hot yet keep you snug and warm on colder nights. Wonderfully lightweight they wrap around your body like no other bedding and are amazingly luxurious and comfortable. Once you have slept under a Luxury Range Silk Bedding Direct mulberry silk-filled duvet you won't want to revert to any other type of bedding. The mulberry silk interior also contains natural properties that promote relaxation in the central nervous system thereby aiding restful sleep. Totally ideal for bedding for young children. Buy a fabulous Luxury Range cot size long-strand mulberry silk-filled duvet now and receive a Free High Quality Carry and Store Case for each duvet purchased.